Looks funny, do you have a larger version of this by any chance? Nope - I took it on my phone. 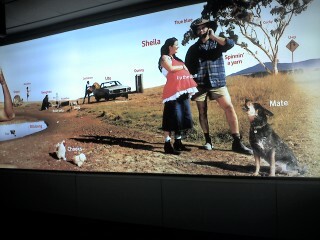 There seemed to be a series of these ads in Sydney airport. I had a quick on-line search but could find nothing. Perhaps you should drop into a vodafone store to see if they have anything. Hey, this isn’t very detailed but it shows a few different angles of the ad. I thought it was really awesome too. After 5 months in Europe, it was THE BEST thing to come home to, I had a good laugh! Thanks Kel for this great contribution. I couldn’t find any links on-line.